Australian Lleyton Hewitt claimed the biggest scalp of the US Open men's draw so far as he beat sixth seed Juan Martin del Potro 6-4 5-7 3-6 7-6 (7-2) 6-1 in four hours three minutes. 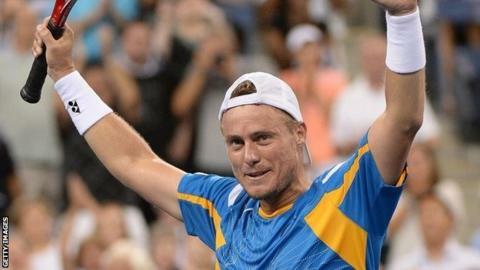 Hewitt, 32, is eight years older and ranked 60 places lower than 2009 champion Del Potro. Elsewhere world number one Novak Djokovic saw off Germany's Benjamin Becker to reach the third round. In the women's draw, defending champion Serena Williams won in straight sets. The world number one swatted aside Kazakhstan's Yaroslava Shvedova 6-3 6-1 in one hour and 14 minutes in the early hours of the morning, to set up a meeting with fellow American Sloane Stephens. before overcoming Argentina's Leonardo Mayer in four, while Czech fifth seed Tomas Berdych also won. The first two rounds in the women's singles saw 459 aces and 687 double faults. Djokovic, the 2011 champion, saved two set points in the opener before coming through 7-6 (7-2) 6-2 6-2. "Today was tricky conditions and the first hour I wasn't able to play as well as wanted. After that I felt more confident," said Serb Djokovic, who has reached at least the semi-finals of every Grand Slam event since losing to Jurgen Melzer in the quarter-finals at the 2010 French Open. His third-round opponent is Portugal's Joao Sousa, who overcame Finn Jarkko Nieminen in a five-set match lasting just short of three hours. Stephens, 20, will play Serena Williams in the last 16. Stephens criticised Williams in a magazine interview in May, saying that their relationship had deteriorated since she beat her compatriot in the Australian Open quarter-finals. But Stephens is now happy with how she and Williams get on. "I think that's all old news now and we've moved on," she said. "We are competitors, we are co-workers so it is definitely tough, but I think now we are in a good place," she told ESPN. Hewitt, who lifted the 2001 US Open title as a 20-year-old, beat world number six Del Potro in their most recent meeting at Queen's in June. "I don't know how many years I have left to play and I was hankering to get out on this court again and put on a show," Hewitt said. "A couple of years ago, I had a few foot surgeries and I didn't know if I would ever play tennis again. But it's a hell of a lot of fun coming out to play and I cherish every match." Del Potro, who hit 70 errors in the match, stated after the match that a long-standing wrist complaint was "not the way I'd like". Hewitt will play Russian world number 102 Evgeny Donskoy in the last 32. Williams, 31, is aiming to become the oldest US Open women's champion by winning her fifth title at Flushing Meadows. She praised Stephens' play ahead of their keenly-anticipated fourth-round encounter. "It's going to be tough, Sloane is playing so well," she said. "I'm always so happy for her. She's doing great. I'm really proud of Sloane. It's going to be a really good match." It might have been a straight-sets win for third seed Radwanska, but the 2012 Wimbledon runner-up needed nearly two hours to beat Pavlyuchenkova. If she wins her next match, against Russian 24th seed Ekaterina Makarova, Radwanska will become the only woman to reach the last eight at all four Grand Slams this year. "It's always about being smart, about how you train and what you do off the court," said the German of still competing at the age of 35. "If your body allows you to do all that stuff, then it's really up to you in many ways." Lisicki, who beat Serena Williams en route to the Wimbledon final earlier this year, is still yet to get beyond the fourth round in any of the other three Grand Slams. Mayer came out on top in a match that saw 10 breaks of serve, setting up a third-round clash with defending champion Andy Murray. Hingis, who was making a return to Grand Slam tennis as a wildcard after retiring in 2007, double-faulted on the final two points of the match. The 32-year-old, who has won five Grand Slam singles titles during her career, also lost in the mixed doubles. She and India's Mahesh Bhupathi were beaten 7-6 (7-5) 7-6 (7-5) by Sweden's Robert Lindstedt and Taiwan's Chan Yung-Jan.
"God, give me a break," said the Swiss, when asked if she had considered making a singles comeback after her doubles return. "No, I haven't given any more thought to it. I have a hard time covering half the court and trying to be there. Full court is completely different ball game." Laura Robson had a worried look on her face after defeat by Li Na, and it was down to an imminent trip to the dentist to have her wisdom teeth removed. "All the other girls in the locker room are telling me their horror stories," she said. "Oh yeah, I pulled my gauze out and it was just blood. So that's not too nice." Novak Djokovic has been quizzed as much about his diet as his tennis in week one, and day five was no exception. "The toughest for me [to give up] was definitely chocolate. My father is addicted to chocolate in a way. Was. Not any more. During events I don't have milk chocolate. If I have chocolate I have cacao or dark chocolate - a very little bit." Li Na is struggling to believe the quality of her own serving, after 11 aces against Laura Robson took her to 21 for the tournament - more than any other woman. "After the match my team said I had over 10, I said 'No like eight or something', my husband said, 'I think even less, maybe six.'" Sloane Stephens has plenty of confidence off court as well as on. "It's tough to have friends on tour, but I don't lack in the social department. I have some good friends. That's not an area that I struggle in." "Belgium is a very good team," says Andy Murray when asked to give his opinion about the Scottish football team's next World Cup opponents. "A lot of good, young players. I think they're kind of sort of dark horses for the World Cup. I think they're very, very good. I wouldn't expect Scotland to beat them." "Everybody has their own issues," says Jamie Hampton when asked about the psychology of tennis. "The girls differ from the guys. Girls are a little bit more emotional. We'll just leave it at that."